In the West, the roads eventually lead to the tracks and the tracks eventually lead to a bridge. And under this bridge lives one Carl F. Polson. Roseville has the biggest railroad yard west of the Mississippi River, and so it also has a murky, musky counterculture unknown to most sedentary Americans. Any person wishing to move north, south or east without paying or standing on the highway with his thumb out and his hat in hand makes his way to the rail yard. Roseville, therefore, is the capital of Hobohemia. Mr. Polson is its mayor. There are three types of people to be found in the train yard: the hobo, the tramp and the home guard. The hobo is one who travels and works. The tramp is one who travels and drinks. The home guard is one who drinks and does nothing at all. Mr. Polson is a home guard, a self-described bum who pedals aimlessly about town, too infirm to strike out on the road. Normally a home guard is disdained by the denizens of the tracks, considered the lowest of the social castes. Yet the whole transient society could not work without Mr. Polson, a 45-year-old bundle of bones and bad teeth. He holds lease to the toughest piece of property in the yard, the sloping mud banks under the overpass. Because the tracks run under this bridge and the bridge is one of the few sheltering canopies, everyone from the itinerant to the gun-toting highwayman comes calling. What each will get is a pull from Mr. Polson's bottle, warmth from his fire and directions out of town. Mr. Polson was found this afternoon meditating on his mattress, amid his malt liquor bottles and filth, watching the trains getting linked together in the cold drizzle. He offered a stranger a piece of processed cheese from his coat pocket, a rare kindness in this otherwise unkind society. "It's all over," he says of the tramping life, cold steaming from his scalp. "The whole thing. The police want everybody out, and you can blame Sept. 11 for it." Mr. Polson, it seemed, is lonely. "I don't have any family," he says and then clasps his hand to his heart. "Christmastime. This is about the time when it starts to hurt." The West has a great tradition of tramping: from Jack London to Montana Blackie to "Coxey's Army" of hobos who marched on Washington in 1894. The culture has been dissipating for decades now, but the last few years have been especially tough. Railroad consolidation and terrorist concerns have brought more railroad police. The many Mexican itinerants brought the Immigration and Naturalization Service. "The yards are too hot anymore," Mr. Polson said. "Most guys take the bus now." There have been other changes. Roseville used to have the most famous trash bin in the West. It was filled nightly with day-old sandwiches wrapped in plastic. But the owner sold to a frugal man, and the seagull-like horde that once flocked there for supper has moved on. No one knows how many people are out on the rails, how many are cheats, how many are workers. Railroad officials refused to provide arrest or manpower statistics. But privately, the railroad police estimate that there are 5,000 tramps traveling across the country at any time. According to the National Railroad Administration, there have been 730 trespasser deaths on the nation's tracks this year through September, including 101 in California. Tramps might be taking the buses now, but if word in the hobo jungles is to be believed, California is still the land of milk and honey. 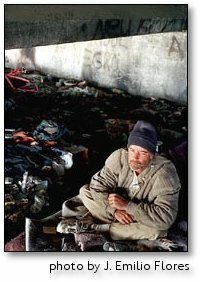 There are about 1.1 million homeless people in the Golden State, according to the governor's office. This means that California has a homeless population larger than the population of Detroit. Many are drawn in part by the good weather and generous welfare payments. Beyond the single mothers, the maimed and the ill who reach for the helping hand, there is the so-called stamp tramp who bites it. The things that society holds dear - work, self-sufficiency, moral rectitude - are anathema to him. While the federal welfare overhaul five years ago put single mothers to work, many California counties continue to make payments to capable indigent men. For instance, San Francisco gives $395 a month plus food stamp vouchers. Similarly, Los Angeles gives more than $220 and $135 in food stamps. The counties' welfare programs are not linked by computer and there is little to stop a person from collecting his benefits in San Francisco, jumping the freight train and making his way to Los Angeles to collect again. With fake identification, a person can collect welfare perhaps four times a month. The tramp will more likely spend it on crack and booze, since mission food is free. "These riders are billing the system for tens of millions," said Detective Mike Quakenbush of the Portland, Ore., police, who five years ago hunted down a tramp known as Sidetrack who was convicted of killing four tramps and using their identities to cheat welfare. "He had upwards of 20 accounts and kept a book to keep it straight," the detective said. "He was whacking guys, then opening welfare accounts across the country in their names. The welfare authorities don't like to check." In San Francisco at least, living on government cash handouts will soon get harder, for the just and the unjust. The citizens there voted to cut cash welfare payments to $59 a month, effective next July. The good life has gotten so destitute that Mr. Polson is considering the horror of horrors: picking up a hammer and going back to work. "I'm a pretty good handyman," he said. "I can fix almost anything. I just have to fix myself first." He thinks he may go to the warm climes of Key West, and when he goes, he said, he'll take the bus.